Sebastien is part of the RD-Connect Management Team, supporting the coordination team and project partners with technical, administrative and financial matters. After a PhD in cellular and molecular Biology at Pasteur University (Strasbourg, France) and a post-doctoral fellowship in BCMP department (Harvard Medical School, Boston, USA), Sebastien spent 6 years in a start-up company (CYTOO) as Head of R&D projects. 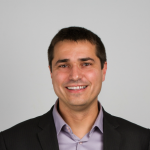 In 2016, Sebastien joined FINOVATIS as consultant/project Manager.